NOTE: Entries are going to be a bit jumbled and out of order. Adequate internet access has been, at best, inconsistent when available at all. We heard all the rumors. 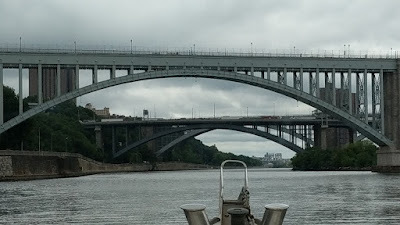 We had heard that there were hoards of wild, evil, out of control youths all lined up waiting for some poor, unsuspecting recreational boater to have made a wrong turn at Hell Gate. They stood in battle lines on the overpasses armed with bowling balls, rock, couches, and household appliances waiting to pounce and shower those dead-weight bombs onto the decks below. (Seriously, we heard they heaved couches and appliances.) The Harlem River was their wild frontier, and boaters were trespassers subject to the full gamut of punishment that the inhabitants could muster. We also heard that navigating the river itself was “tortuous”. (That's in the Active Captain description.) The Harlem River was a convoluted mess, with a seemingly infinite number of commercial boats that wound up and down and side to side, and that they were a direct threat to the lives of anyone who thought of traversing the river in a recreational vessel. And the river itself, with its bridges and turns, was nothing short of a hellish horror. Oh, and the stench from the pollution and trash would make you ill on the spot. Stay away! There be monsters there! Eh, hold on a moment. That's not what we found. 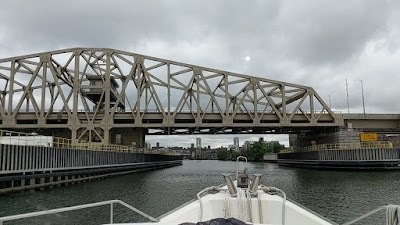 The main reason to go up or down the Harlem River would be to avoid the East River and having to go around the southern tip of Manhattan to get to the Hudson River from Long Island Sound. And that's what we did. 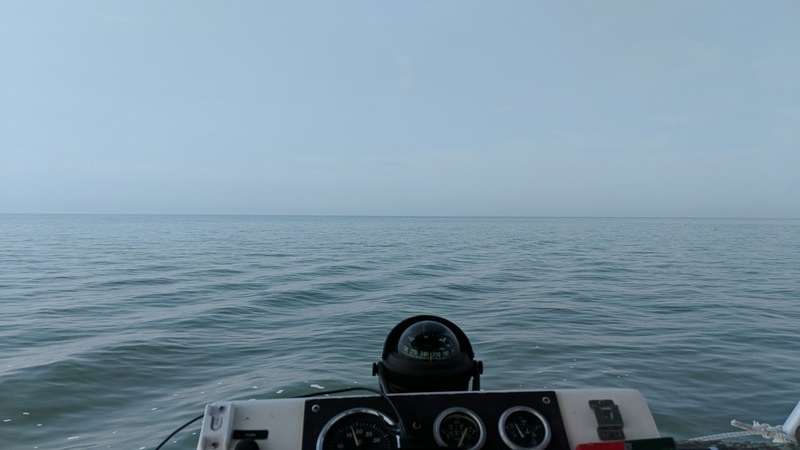 After three weeks in the sound, it was time for us to get back on our main course and get on up to the Erie Canal to finally reach the end of our 2018 cruising season. 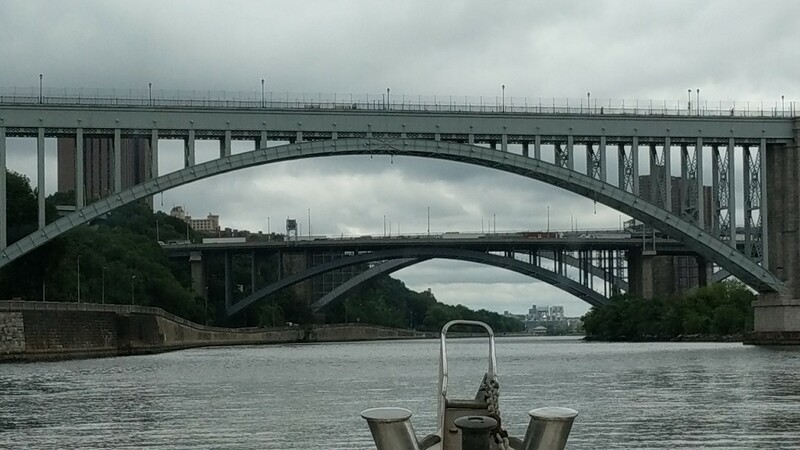 Technically, from R-14 at Hell Gate to just past the Spuyten Dyvil Bridge, it's 8.0 statute miles on the Harlem River. From and to the same points, the route around Manhattan on the East River is 21.5 sm. That's 13.5 sm saved right there. (You can do the math of how much time that would save you based on your speed.) There is a current, but it wasn't terrible at all when we went through. I would suggest hitting it at or near slack current anyway – no need to tempt fate. They do tell you to run at idle speed. We ran it at about 6.5 smph. 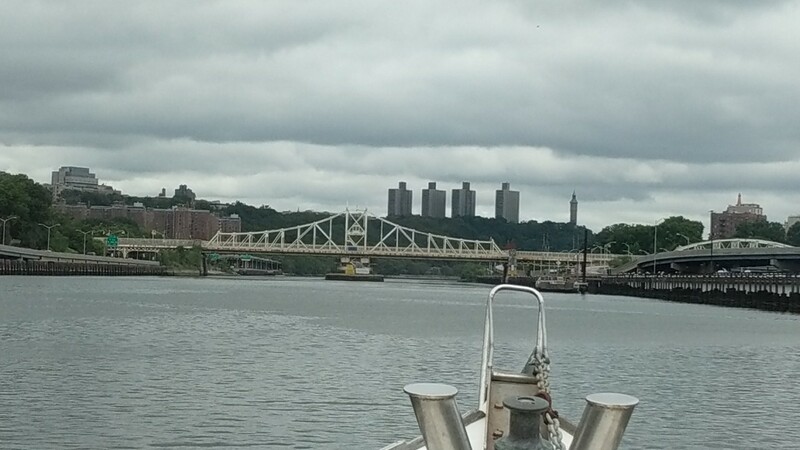 If you're a sailboater, unless you have dropped your mast, go on down the East River. 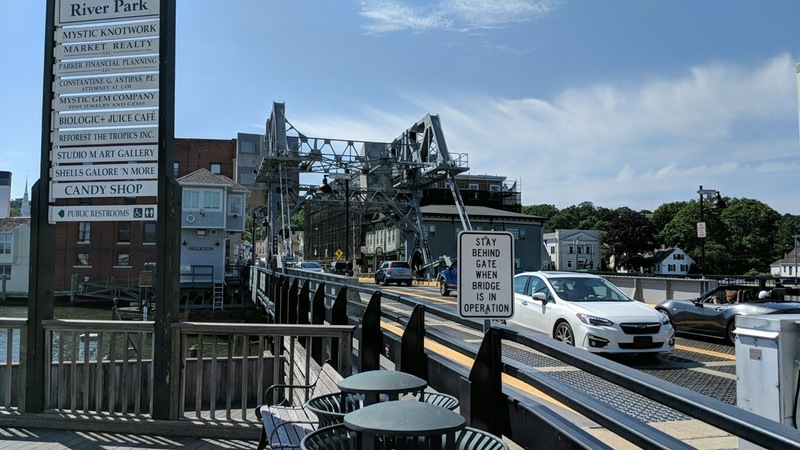 The swing, lift, and bascule bridges all have big signs on them that say you have to give the powers-that-be four hours notice of needing a bridge opened. In other words, they don't want to open them for nobody. Sorry, sailors. Otherwise, the lowest vertical bridge clearance is 24 feet. I didn't see anything about the water's depth to be alarmed about at all – all double-digit in the teens or deeper. What about boat traffic? We ran the river from about 1100 hours to 1300 hours on a Monday. We saw only one working boat on the water – only one, and that was a small tug pinning a barge against the shore at a construction site. And except for a couple of kids on a PWC further up the river, that was all the boat traffic there was. Period. Not a skiff, not a fishing boat, not a water taxi … nothin'. And what about the hoards of heathens waiting to pounce on us? I swear on my mother's grave, we saw a total of three pedestrians on one bridge. And, again, except for the two youths on the PWC, that was all we saw – three. And they were walking across the bridge (behind a tall chain-link barrier) going about their business, living their lives. Maybe we were lucky. Maybe all the work boats were broken. Maybe all the savages were taking a coffee break. 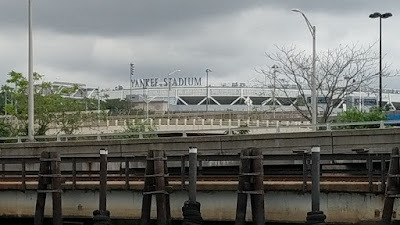 Or maybe the hype of how dangerous and “tortuous” the Harlem River is is just that, hype. You have to decide for yourself. As for us, we found it to be fascinating. It was a unique opportunity to see things from a different perspective. Water is everywhere, including the inner cities of America. Taking the Harlem River as a useful shortcut is a way to see that side of it. The third and final day of your NYC adventure was a chance to see some sights that didn't fit into our agendas for the first two days. We rode the subway and did a lot more walking. All in all it was a fun, fun day. And just like that, our three days in New York City was over. It was a blast. Don't forget to like the video, subscribe to the channel, share it with everyone you know, and click the little bell so that you receive notifications whenever I post a new video. You can also post questions and comments here. Seeing NYC from the open, top deck of a double decker bus was very, very cool. We had an uninterrupted view of all the excitement. The weather all three days was exceptional too – perfectly comfortable. New York, New York, a wonderful town. 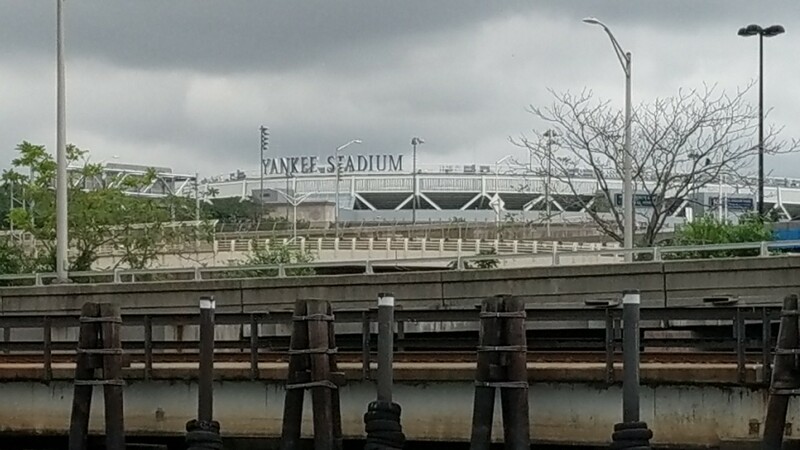 The Bronx is up and the Battery's down. The people ride in a hole in the ground. New York, New York, it's a wonderful town! The ultimate side trip of side trips, New York City. And we had three days to enjoy it. 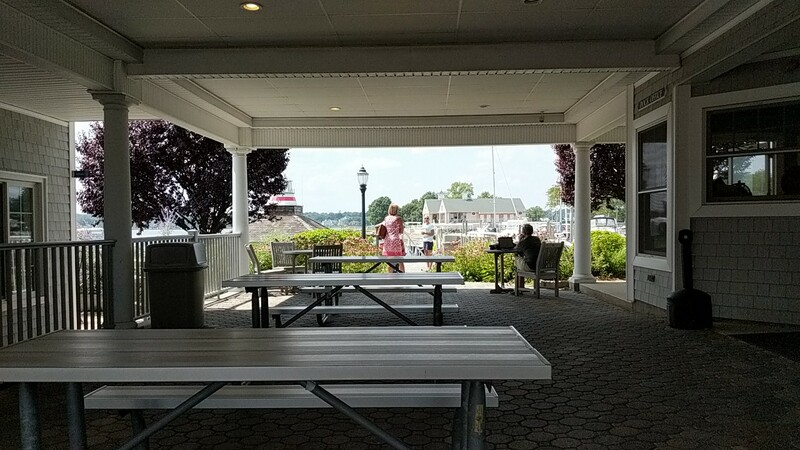 From Capri Marina in Port Washington, we hopped on the Long Island Rail Road to Penn Station. That is where our daily adventures started. And by the way, we wholeheartedly recommend the New York Pass. It may seem pricey, but it covers a lot. It also pushed us to the fronts of lines. Get one! 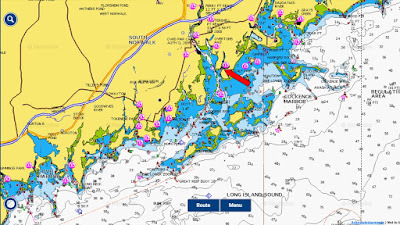 N: Navigability – Up the Norwalk River Channel. It's well-marked with good depths. Stay in the channel. 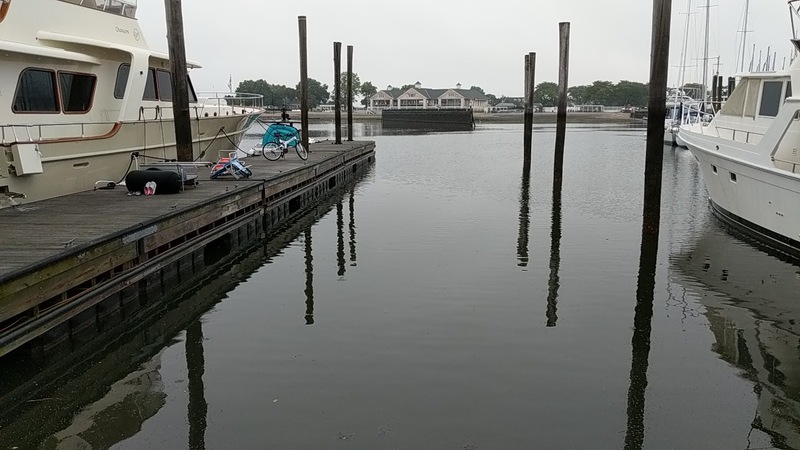 D: Dockage – Floating docks of varying lengths and thoroughfare widths. The slips all around the marina seemed to be ample in size with plenty of maneuvering room. The tide swing is rather pronounced. But the marina seems to have ample depth everywhere, but don't stray. On our second trip there we were docked where they put the biggest boats, including a large Italian-designed yacht. Our slip was huge! And there were several large boats tucked in nice and comfy. 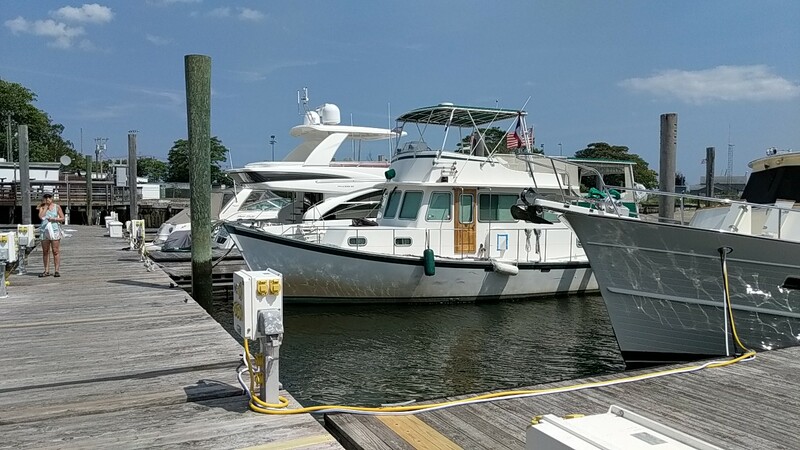 S: Services – Norwalk Cove Marina is a full service marina. They offer electricity, water, and a complete service department. They do haul-outs and on-the-hard storage during the off-season. Pump-out is at the fuel dock. 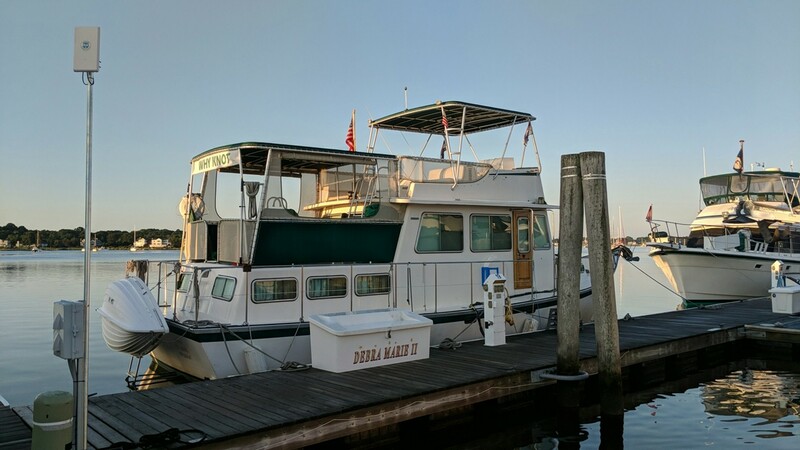 I used Dockwa to book our stay. Make sure you follow up with a phone call to confirm any changes you may make to your itinerary. A: Amenities – *** Special Note: The staff was nice EXCEPT they were not forthcoming about available amenities at the time we registered. For instance, they never told us about the shuttle available into Norwalk. And going back to the available pump-out, maybe there was some other pump-out option, but we didn't know. There is a main building where most of the amenities are, and it's a nice, clean, modern facility. There is a small coffee shop, which was nice. The ship's store and chandlery was exceptional! It was large, well-stocked, and quaint. There are bathrooms with showers in two locations: at the main building and at another building more toward the marina's street entrance. (I'm really tired of bathrooms with cramped stalls.) 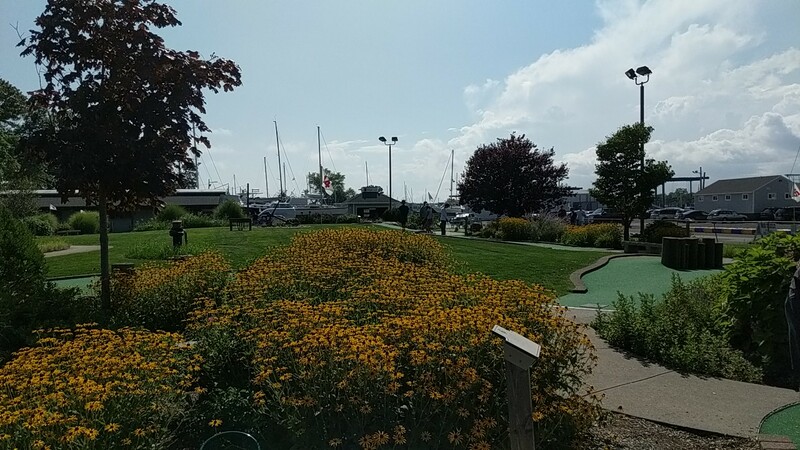 The marina's most notable amenity is their miniature golf course, a putt-putt course. It was a delightful diversion. 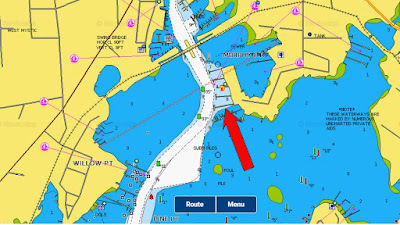 A: Accessibility – It's two miles (according to Google Maps) from the marina to the town center on the river. It's called the SONO neighborhood and there are restaurants and bars. It was surprising that there was very little shopping to speak of. We rode our bicycles several miles exploring the area and really didn't find anything that we could sink our teeth into tourist-wise. There's an aquarium with an IMAX, but that's about it. Our take-away is that Norwalk is first and foremost a nice residential town, not a tourist town, and that's fine. It was nice. P: Provisioning – We didn't need to provision so it wasn't on my radar to pay attention to that too closely. There are a few small markets on the east side of the river, which is where the marina is. Supermarkets are all on the west side of town, on the other side of the river. P: Price – Their transient rate was $3.50 per foot according to our invoice, plus electricity. No discounts. We booked our slip through Dockwa dot com. Verdict – A nice marina, a nice town – it was nice. It wasn't spectacular, but nice. 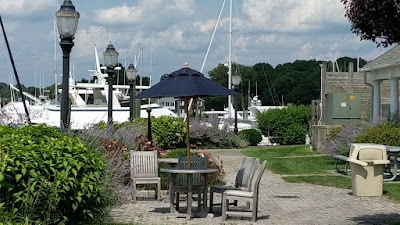 And if you have a yacht, or any big boat, Norwalk Cove Marina is very accommodating. 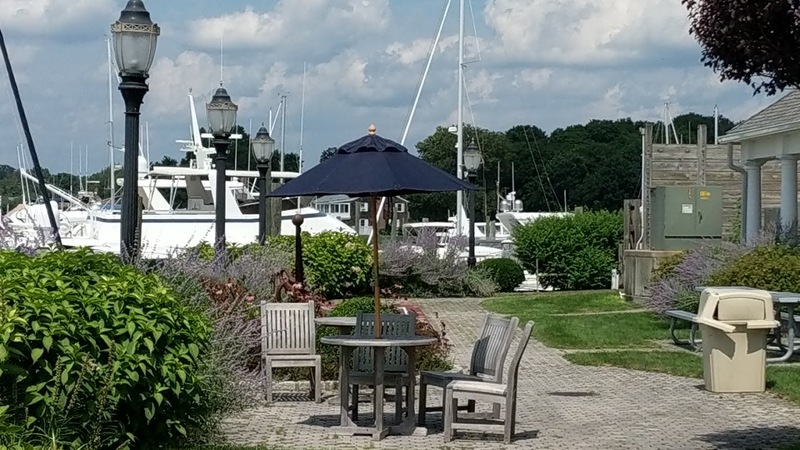 If you want a nice experience, by all means, go to Norwalk Cove Marina. CLICK HERE TO SEE VIDEOS AND PICTURES! When we set out on our cruising adventures, we rarely go back to someplace once we've been there already during the season. This year we've done it twice. (Actually, three times, but that's another story.) The first time was when we went back to Summit North Marina in Delaware after we visited Philadelphia. That was a stop of convenience. 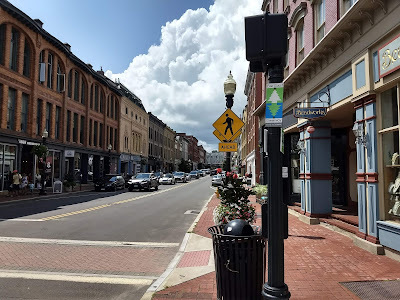 The second time was when we went back to Norwalk, CT. That was because we felt we had short-changed that destination the first time, and we wanted to check it out. 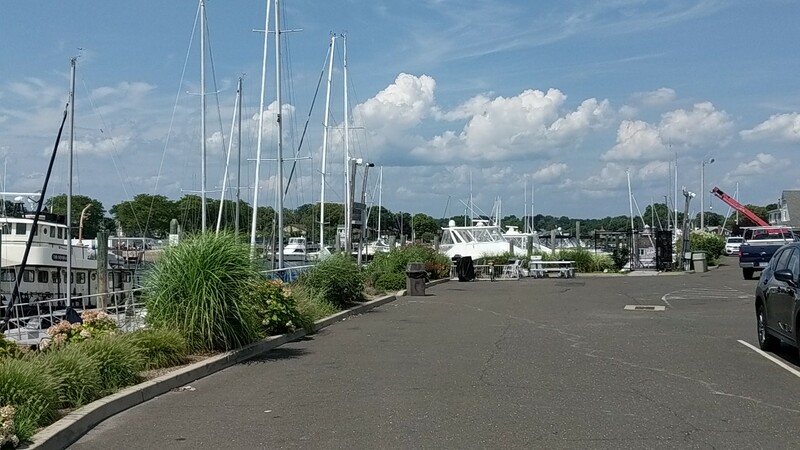 First of all, the marina, Norwalk Cove, is as hospitable a marina for big boats as you can find. There will be more about that in a future marina report. Let's say for now that if you have a boat that's a bit bigger than most, you'll love Norwalk Cove. The town itself is fine. 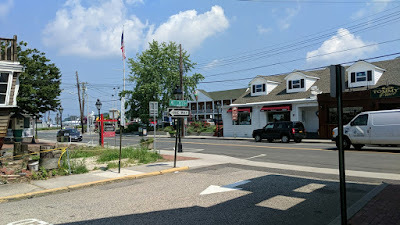 The SONO area (South Norwalk, the part of town closest to the marina) is made up mostly of restaurants and bars, not shops. It's not a quaint New England town but a vibrant city. It's “millennial” in its vibe and very cosmopolitan. There's a rich tapestry of different cultural, national, and ethnic impressions. We both said that if we were thirty years old again, Norwalk would certainly be worth a look as someplace to live. And maybe that's how to describe Norwalk: it's a nice place to live, but not a tourist destination. But you should certainly make the time to go there. There is one feature of the marina that deserves special mention: they have a miniature putting course, and it is AWESOME. I won by five strokes. 2018 Cruising Season Sit-Rep – Where do we stand? 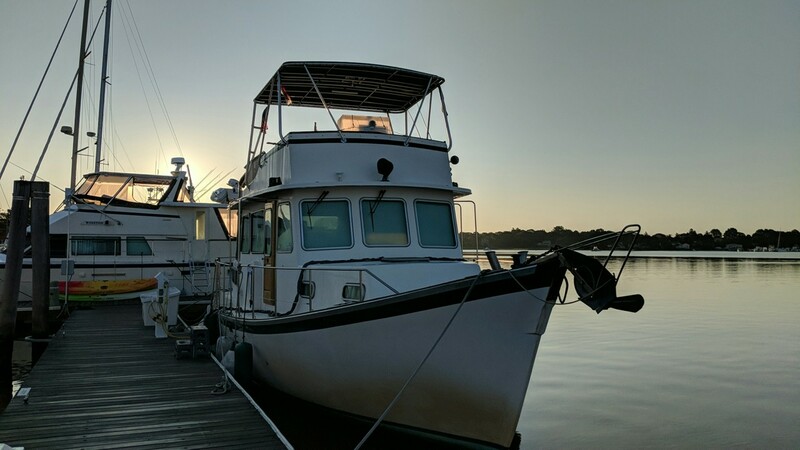 In this video, 2018 Cruising Season Sit-Rep – Where do we stand?, I bring you an up-to-date situation report on where we've been and what we have left to cover. 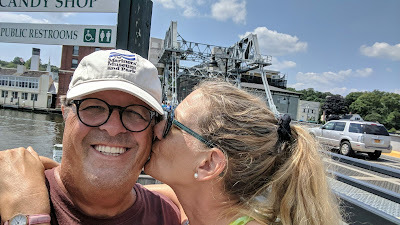 #annapolis #longislandsound #mysticct #mystic Even though I'm a big-time planner (some would say I'm persnickety about it) I have bent and flexed myself to make sure we got the maximum fun, enjoyment, and excitement from this season. Don't forget to like the video, subscribe to the channel on Youtube, share it with everyone you know, and click the little bell so that you receive notifications whenever I post a new video. Also, send me a friend request on Facebook. You can also post questions and comments here. 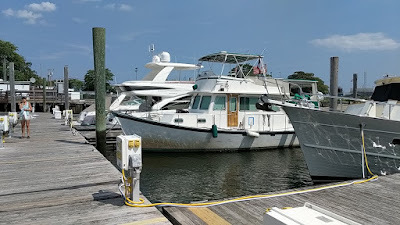 My original plans were for us to cruise out Long Island Sound along the north shore out to Mystic, CT, then across the sound to Greenport, LI NY. From there we were going to go back to the north shore and head west. I'm not sure why I changed my mind about that, but I decided it would be better to try a different tack. I think it had something to do with me being suspicious about anchoring opportunities on the way back west. 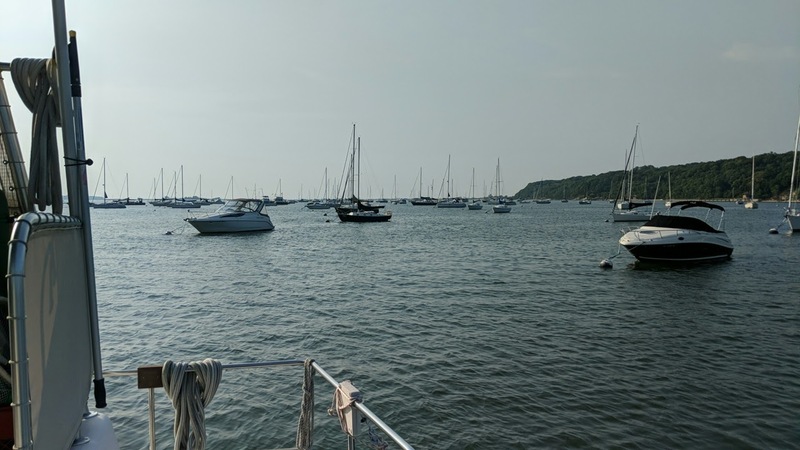 We still went out the sound on the north side from Manhasset Bay, NY to Norwalk, CT to the Thimble Islands, also in CT, then to Mystic. 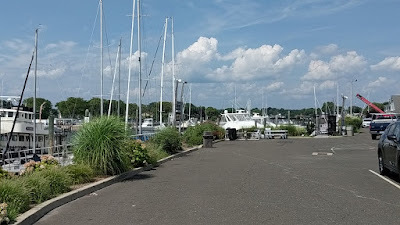 But on the way back west, instead of going to Greenport, we crossed the bay from Mystic to Port Jefferson, LI NY. Our research showed there was a good mooring field with a pump out boat, a vibrant touristy town, and a free launch service, aka a water taxi. I liked how it all sounded. 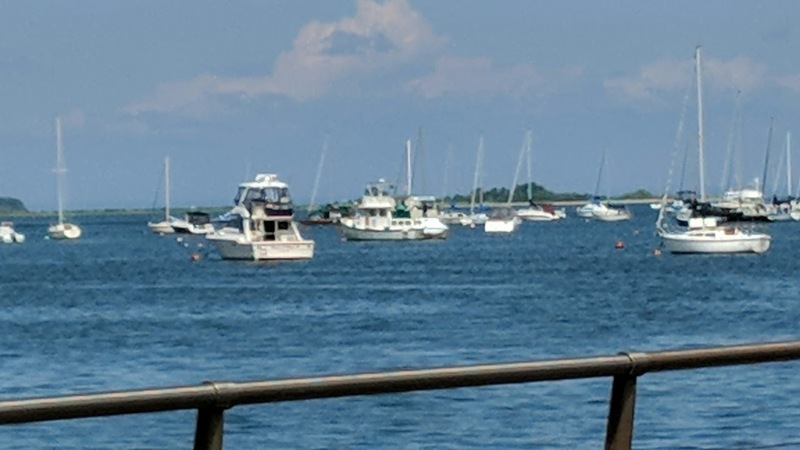 As was the case for most of our excursion into Long Island Sound, boating conditions were excellent, if not a little boring. There was very little wind and calm seas prevailed. It was an easy boating day. 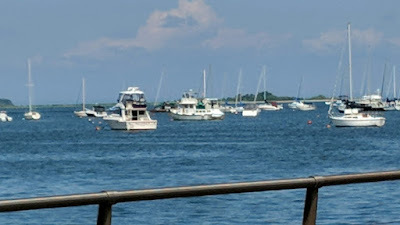 The only thing that we had to pay special attention to was to keep a sharp lookout for the large ferry boats that steamed from the Port Jefferson inlet across the sound to Connecticut. 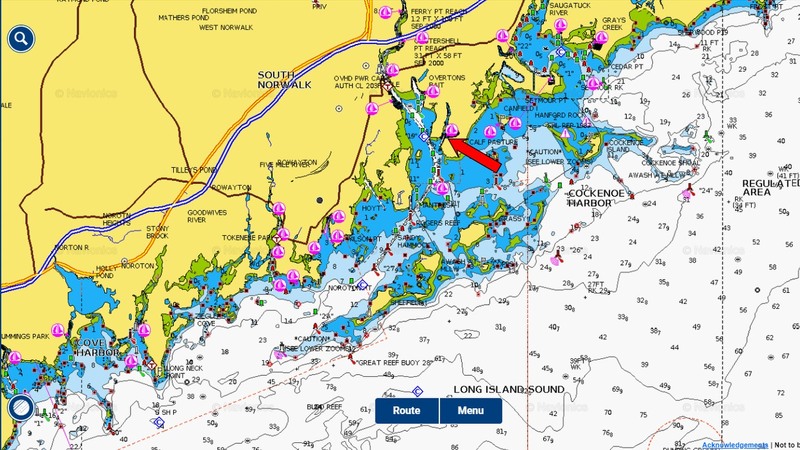 The inlet itself is well protected with a wide, clearly marked channel that heads due south toward the town of Port Jefferson itself. There are mooring fields on both sides of the channel. The main field is on the left (east) side as you approach the docks and town. There is some kind of large rock and gravel operation on the right (west) side that loads and unloads onto and from barges around the clock. The moorings on that side are nearer the entrance of the bay. There are a couple of marinas there but, wow, are they expensive. The pump out boat, as we found out, is only available on Friday, Saturday, and Sunday. One of the marinas has a pump out, but it wasn't working while we were there. There is also a unique manually operated pump out barge directly to the left as you enter the inlet, but it didn't look large enough to accommodate a boat larger than maybe 35 feet long. It's painted white; you'll spot it easily. It may work great, but we didn't try it. Getting to shore via the town's free launch service is convenient and quick. They standby on channel 68 and take you ashore near a boater's building with a security lock that has bathrooms, showers and laundry. This building is pretty much in the heart of the city center. It seems to be an efficient operation. Once a shipbuilding town, Port Jefferson is now a full fledged tourist destination with all the trappings. From fudge to ice cream to little trendy restaurants to interesting museums to shops of all kinds, Port Jefferson wants you to spend money there. The most trendy area is on East Main, appropriately named as it is one block east of Main Street. (See the separate marina report for provisioning and accessibility information.) It's a busy and pleasant town. And as we have a preference for mooring fields (and we have a great Phasor generator) it was a terrific stop and one we would make again. #marinas #marina #marinareport It's time to catch up on marian reports. Cruising Long Island Sound to Mystic, CT was a great experience. It was well worth the effort and expense. The town was fun, and the sights were interesting, and the marina we stayed at, Safe Harbor Mystic Yacht Yard, was, in my opinion, average. Yep, average. 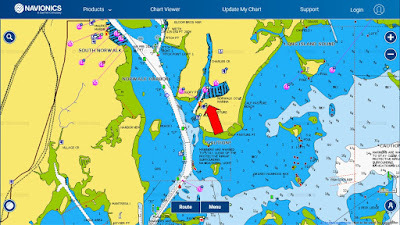 N: Navigability – Safe Harbor Mystic Yacht Yard is up toward the north end of the Mystic River in Connecticut, very near the Amtrak swing bridge before the town center. The channel is well marked with good depths. D: Dockage – Floating docks of varying lengths and thoroughfare widths. We were docked at two different locations. The first was in a slip near the fuel dock; the thoroughfare felt tight but wasn't a problem when we had to move the boat. Our second dock was a facing dock with lots of room. There's 30 and 50 amp electricity and water. They have a good dock crew. The docks aren't new per se, but have been very well maintained. The dock pilings are new-ish. 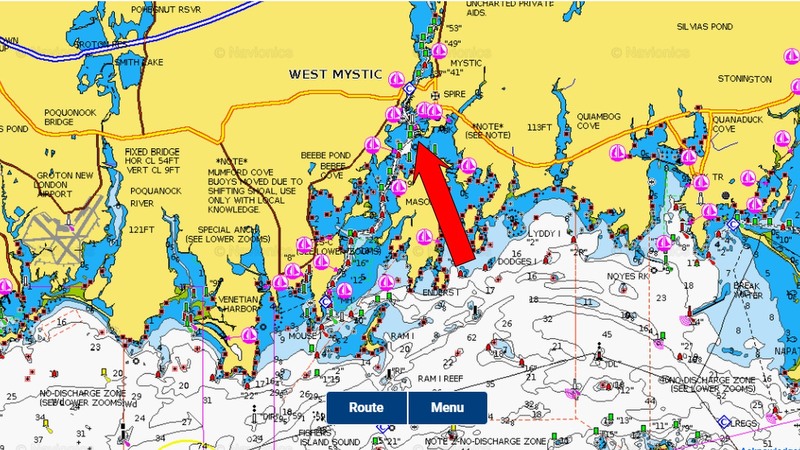 Wind and current should be considered when docking and undocking. A: Amenities – There is a main building where most of the amenities are, and there's nothing super-special about them. Actually, there are some oddities to get used to. The large laundry room is on the second floor and you have to lug your laundry bags and baskets up and down a long flight of stairs. The bathrooms in the main building are weird; the toilet stalls are small, and the showers are shaped odd with stairs in them. There are much roomier and accommodating showers and lavatories in the bathrooms at the outbuilding by the swimming pool. There's no ship's store or bodega on the premises. You have to go off-property if you want to or need to buy anything. 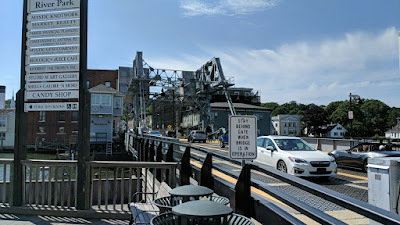 A: Accessibility – It is .9 miles (as per Google Maps) from the marina office to the middle of the drawbridge in Mystic. That's not a terrible walk by any means. We used our bikes a lot, but there are only a few bike racks in Mystic. Enterprise picks you up – we rented a car for a day, and we're glad we did. P: Provisioning – There's one supermarket in the area, but it is are not easily accessible without a rental car or ride-share, or as in our case, bum a ride off a boating buddy. We ended up bunching-up all of our activities that initially required a car into one twenty-four period: some touristy stuff, grocery shopping, etc. We then used our bikes for getting in and out of Mystic. P: Price – Their published transient rate on Active Captain is $3.50 per foot plus electricity. No discounts. We booked our slip through Dockwa dot com. Verdict – Mystic and the Connecticut maritime coast is very cool. 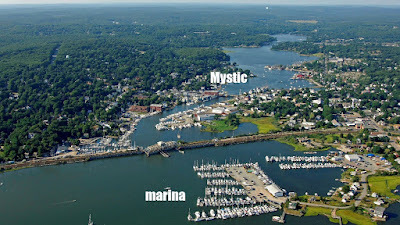 We enjoyed going to New London, and Mystic itself is fun. It's a great destination! But this is a marina report, and Safe Harbor Mystic Yacht Yard in and of itself is nothing special. It may be spectacular compared to the others in Mystic; it probably is. 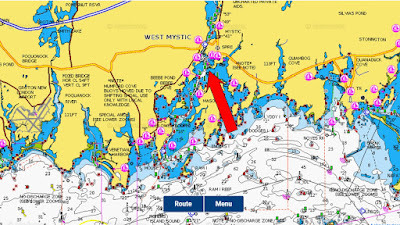 However, we've been exposed to much nicer marinas down south that cost a third of what Safe Harbor Mystic Yacht Yard charges. Now, I understand the entire Northeast is more expensive than the Mid-Atlantic Coast or southeast is. Ya' pays yer quarters, ya' takes yer chances. I get that. But, damn, that's a lot of money for a marina that's nowhere close to being in the top ten marinas we've been too. Mystic and the Connecticut maritime coast is amazing. Safe Harbor Mystic Yacht Yard is average. 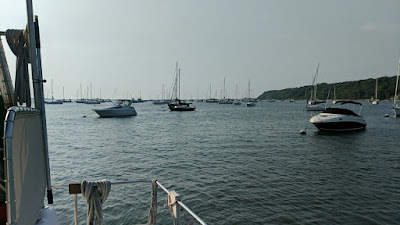 The great boating conditions continued as we motored our way to our easternmost destination: Mystic, CT. As this video title says, it has New England charm and quaintness in abundance, and we enjoyed ourselves tremendously. It has cute shops, museums, exhibits, some okay restaurants, and lots and lots of people. You have been warned. 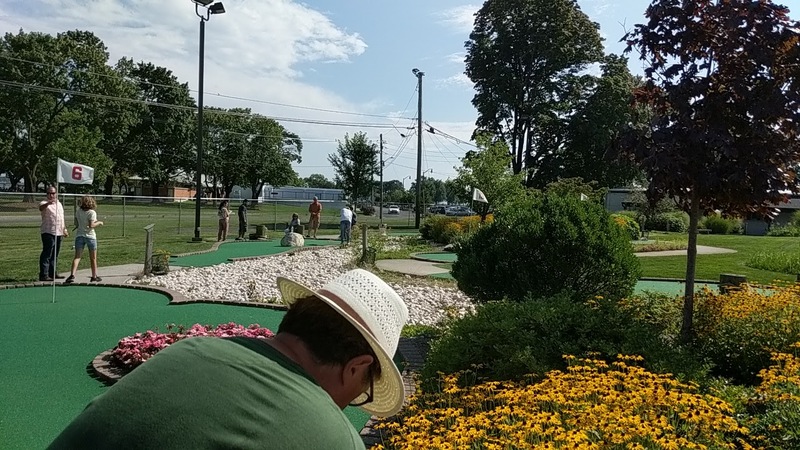 One of the things we learned is the good people of Connecticut consider themselves to be New Englanders rather than Northeasterners. Even though the state is connected to New York on its eastern border, there is most definitely a different feel or vibe to it. I don't quite know what the differences are, at least when they are so close together, but they hang onto them fiercely. We did rent a car and took a side trip. One of season objectives was to visit the United States Coast Guard Academy in New London, CT. As recreational boaters we're big supporters of all the Coasties. Furthermore, at the recommendation of many, we ate lunch at Captain Scott's Lobster Dock, also in New London. I guess this is as authentic New England chow as you can get, and it was good! Our visit was made even better by getting better acquainted with Bob and Lynda of the vessel Erika Lynn. They were wonderful hosts and we look forward to being with them again sometime in the future.